For those that missed or could not attend our second open forum on October 3rd with Karen Miller and David Provost, we were fortunate to have Media Services on hand to record the entire meeting. Please note that the video is only accessible to people logged into the Middlebury network. The video is hosted HERE. We are still awaiting the answers to questions that staff council submitted, and will post them or the link to them once we have them. Also don’t forget to check out the new Financial Sustainability Website, with information on workforce planning and the voluntary separation offer. This entry was posted in Midd Blogosphere and tagged Workforce Planning on October 16, 2018 by Tim Parsons. The rollout and communications from the administration and other media sources is scattered in several different places and formats. Below is a chronological order of all the information that we are aware of at this time. Please add to the comments if there is anything forgotten and we will update the post. The first information was an all staff email from Laurie Patton, sent from the Office of the President on June 19th, it is on the web here. The followup email with an accompanying FAQ from David Provost and Karen Miller came out the following week. It does not seem to be on the Middlebury website, but we posted it on the Staff Council Blog here. The Voluntary Separation Plan was sent by email July 30, it is on the web here, (PDF) , but we can’t seem to find the accompanying PDF of the Staff Incentive Separation Plan Chart. Staff Council regularly meets with the administration, and we posted a blog article with questions we’d gathered and received answers to on August 3. August 8th was a blog post from Karen Miller “Defining Our Future State”, with a PDF of FAQ’s here. That document lays out the timeline for the workforce planning process. Tangentially related to workforce planning and being worked upon concurrently is Institutional Performance Management, that was announced in MiddPoints on August 22. Staff Council holds it’s first open forum of the year on September 19th, focusing on Workforce Planning. The questions generated were posted to the Staff Council blog, and also submitted to the administration. We hope most of them will be answered at the next open forum. This entry was posted in Midd Blogosphere and tagged Workforce Planning on October 1, 2018 by Tim Parsons. 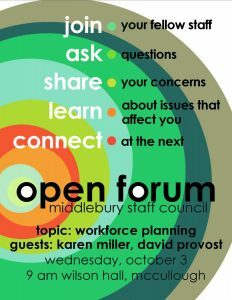 Please join us for the first open forum we’re hosting this year. 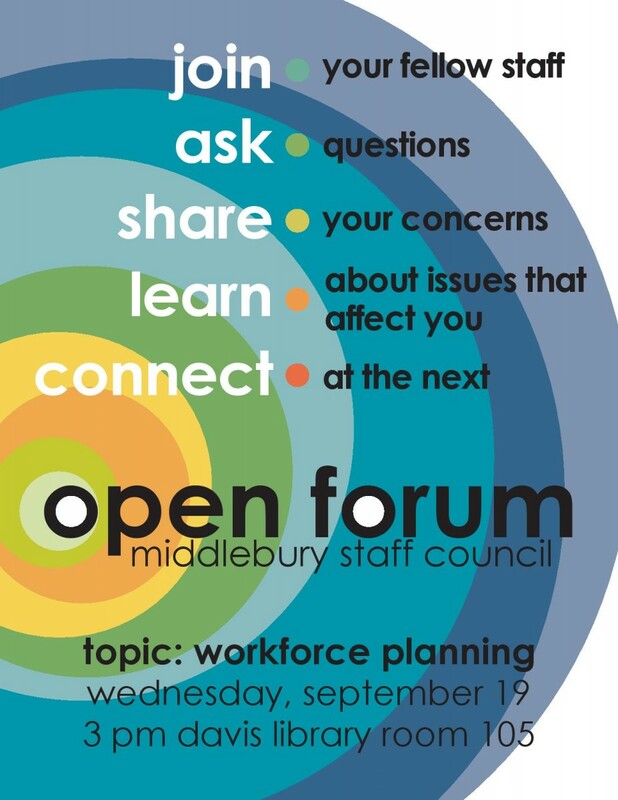 Come tell us your questions, concerns, or any other feedback you’d like to give on the Workforce Planning effort taking place across Middlebury this fall and winter. Your staff council will be meeting with the senior leadership group to share your feedback. This entry was posted in Midd Blogosphere and tagged Events, Workforce Planning on September 16, 2018 by Tim Parsons.